June brought an abundance of wildlife observation opportunities. Staff and guests alike returned from our guided outings proud of the photos they would bring home of their adventures in Denali National Park. Camp Denali & North Face Lodge’s commitment to active learning and stewardship enhances these stunning moments. Many guests will attest to the unique experience of being able to learn about wildlife in Denali’s natural and remote setting. The summer began, as usual, with wonderful birdlife. 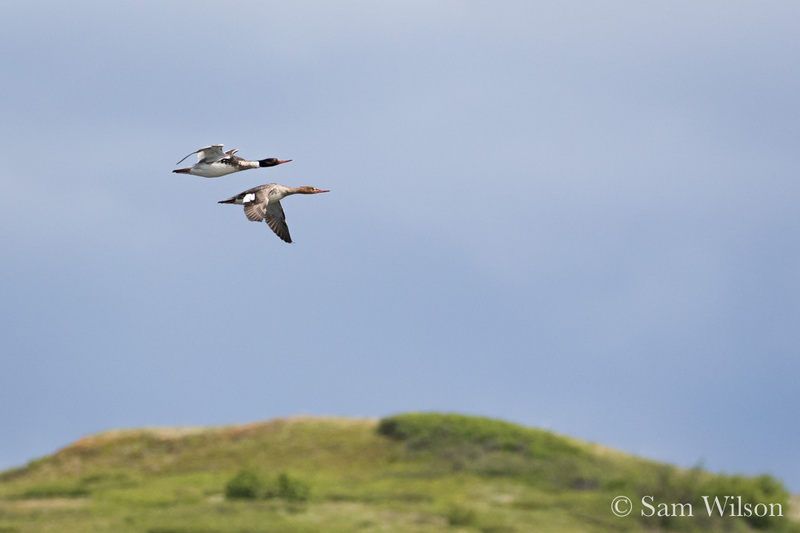 Foray outings in search of these migratory species were enhanced by the programs of Stan Senner with National Audubon Society, and David Sibley, of Sibley’s Guide to Birds. A highlight for birding enthusiasts was a family of Hawk owls who took up residence close to the road this year. 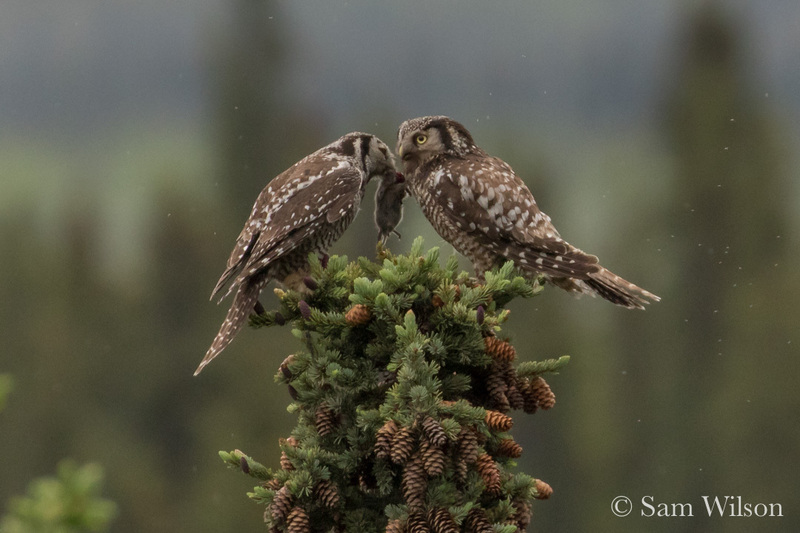 These elusive birds offered a rare opportunity to view the mating ritual between two adults, as well as the raucous hooting of a fledgling Hawk owl. 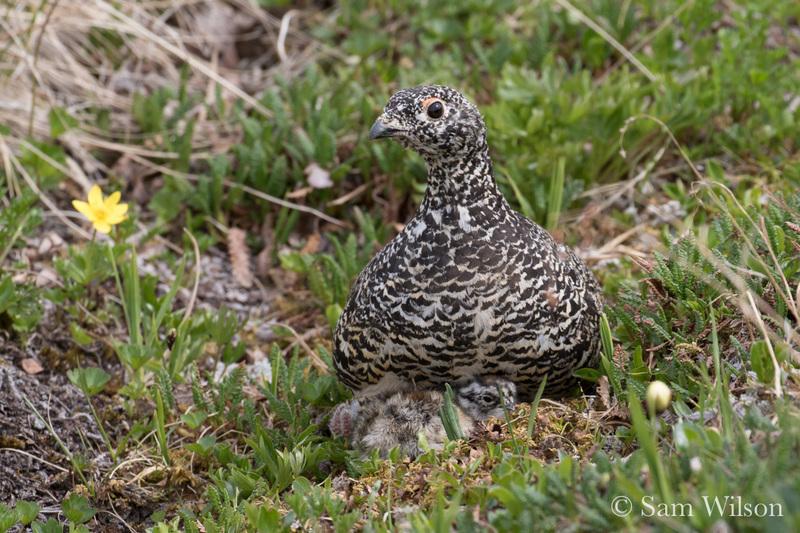 A few other favorite sightings included Red-breasted Mergansers, a Green-winged Teal duckling, Willow Ptarmigan with newly hatched chicks and a Long-tailed Jaeger in flight. There have also been some homerun sightings this summer of Denali’s larger mammals. The season began with staff returning for the season with unrestrained excitement over seeing a wolf, or several (! ), during the drive to Camp Denali & North Face Lodge. The wolf population in Denali has been declining for several years. The National Park Service and local advocacy groups have been working towards increased protection for these predators on lands surrounding the park. 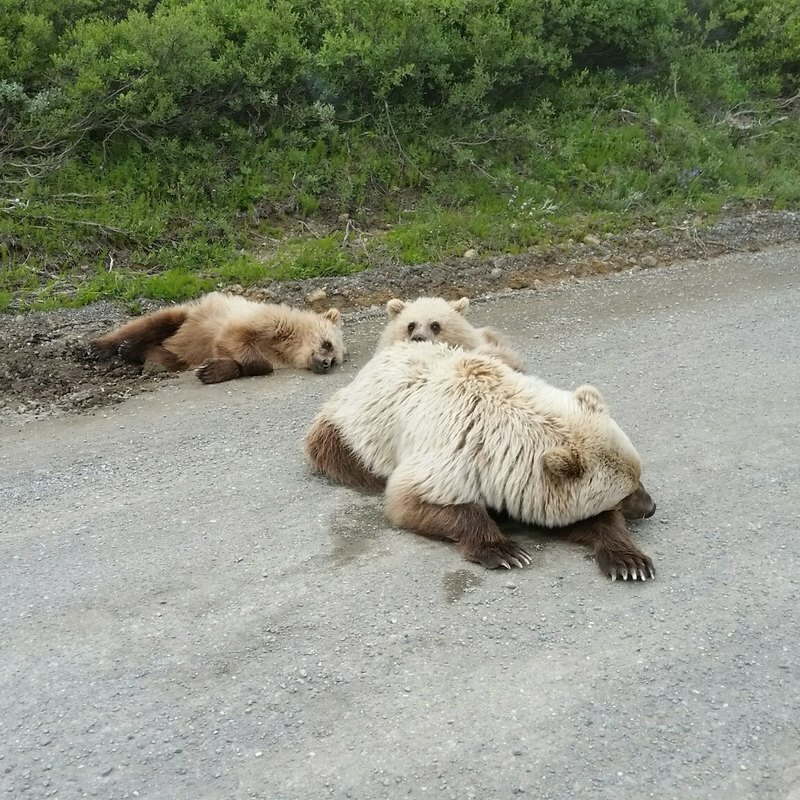 Guests returned one day delighted having observed a family of grizzly bears, a sow and two cubs, using the road itself as a midday napping location. Cubs are born midwinter and will stay with their mother for up to three years. These cubs are yearlings, spending their second summer with this sow. In days since, the same pair of cubs has been observed playing and roughhousing with each other; turns out sibling rivalry is similar across species. A large herd of caribou was seen in the high alpine country during a particularly hot week when temperatures reached into the 70s, something uncommon for this region. Wildlife and Alaskans alike were finding ways to cope with the uncomfortable heat, while visitors from Florida and California were thankful not to need winter coats on their summer holiday. Caribou respond to warm temps by seeking out the coolest area available to them – snowfields. The scene could have been mistaken for a crowded beach in Spain. The Dall sheep of Denali are most often seen on the bus tour to and from Camp Denali & North Face Lodge, as we pass through their high rocky habitats. These steep slopes are where they feed and rest, using the rocks and crags to elude predators. 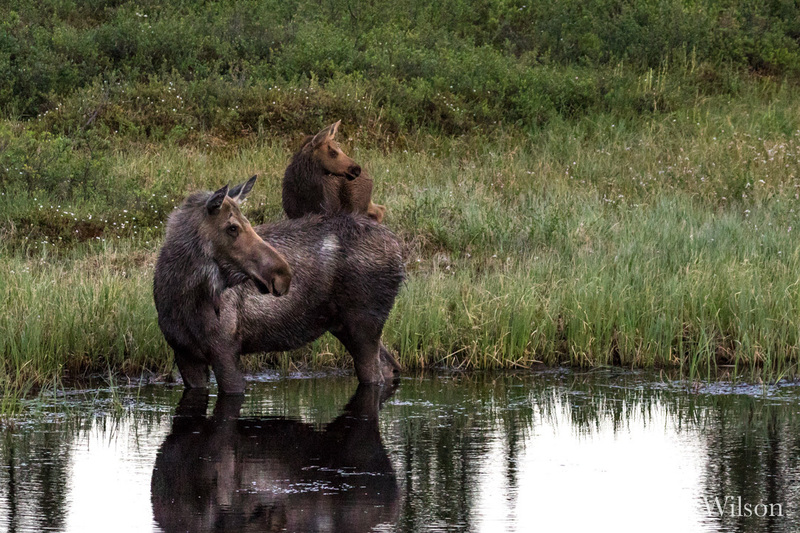 The protection of these mammals was one of the key influences in establishing Mount McKinley National Park in 1917 (it was tripled in size and became Denali National Park & Preserve under ANILCA in 1980). Late one evening in our very own Nugget Pond at Camp Denali, a cow and calf moose took a midnight swim as they grazed on underwater foliage. The only sounds to be heard in the still evening were the ripples created by their movement. Those lucky enough to still be awake watched in silence from our deck as the newborn calf explored its surroundings, always sticking close to its mother. We tell guests that June is without a doubt the most exhilarating time of year in the sub-arctic. This year that indeed proved to be true! Photos courtesy of naturalist guide, Sam Wilson.